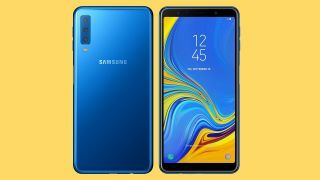 Expanding their A-series lineup in India, Samsung today unveiled the Galaxy A7 with triple camera sensors on the rear. With this, the Galaxy A7 becomes the second phone with three cameras to arrive in India after the Huawei P20 Pro. However, the Galaxy A7 is priced much lower than Huawei’s flagship. Samsung says their new phone is aimed at millenials who like clicking pictures and are hooked to social media. Apart from the triple camera sensor, it is also the first Samsung phone to have a fingerprint sensor on the right hand side embedded into the power key. We have seen a similar solution on Sony phones for the longest period of time. The Galaxy A7 comes with a 6-inch full HD Super AMOLED display panel with 18:9 aspect ratio. The display get Corning Gorilla Glass 3 protection and 2.5D curved treatment on the back glass. The phone runs Samsung’s own Exynos 7885 chipset built on 14nm architecture and has eight cores. It comes in two RAM/storage variants—4GB/64GB and 6GB/128GB, and both come with support for microSD card slot with support for up to 512GB of storage. Moreover, the Galaxy A7 allows users to install applications on external memory card and also allows customisation for memory allocation. To enhance audio capabilities, the company has provided support for Dolby Atmos, which is said to amplify the sound when you connect a part of headphones. The aforementioned triple camera on the Galaxy A7 consists of a 24MP primary lens with f/1.7 aperture, a 5MP sensor for depth with f/2.2 aperture and an additional wide angle lens with an 8MP sensor having f/2.4 aperture and 12-degree field of view. The front camera is a 24MP shooter that features pixel binning technology, that allows the smartphone to combine four pixels into one for better pictures in low-light scenario. Additionally, it gets aided by a 5MP secondary lens to add depth to create bokeh effect. The Galaxy A7 further packs some intelligent camera tweaks like scene detection, their flagship AR Emoji feature and Pro lighting for the front camera. The Galaxy A7 has a 3300mAh battery, dual-SIM with 4G VoLTE support, and all the necessary sensors like accelerometer, gyroscope, hall sensor, proximity and more. It arrives in three colors—Striking blue, premium black and striking gold. It will be available starting September 29th, but if you want to be among the first ones to buy it, you can purchase it from Samsung online store, Opera house and Flipkart on 27th and 28th September. Exclusive available on Flipkart, Samsung shop, opera house for two days and goes on open sale from September 29th onwards.